by Reece, Jane B.; Urry, Lisa A.; Cain, Michael L.; Wasserman, Steven A.; Minorsky, Peter V.; Jackson, Robert B.
I rented this rental text book from here and I loved it. I feel I did very well in my class not only because I love biology, but because this textbook explained everything in such an interesting and lucid way. The pictures and diagrams are wonderful and incredibly helpful. 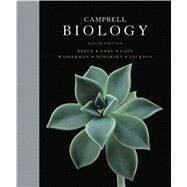 This book's hallmark values accuracy, currency, and passion for teaching and learning have made it the most successful college introductory biology book for eight consecutive editions. I would recommend this textbook for anyone who is seriously interested in Biology. Campbell Biology: 5 out of 5 stars based on 1 user reviews.